Today I'm sharing tips on decluttering kids' clothes. Kids' clothes can clutter up our homes very quickly if we don't stay on top of it. How do we keep them from growing like weeds? What you're left with should be clothes that are the right size, in good condition, and look great! Note #1: For those of you who need to store clothing for a younger child, you don't have to save everything an older child wore. Chances are seasons will be different at different ages, body types are different, and tastes / interests are unique to each child. And don't forget you'll receive some clothes as gifts for the younger child too. Keep the clothes that are favourites, that are the best quality, and that mix and match best with each other. Note #2: If you're sentimental and you want to save some of your kids' outfits, set yourself a limit so you don't end up with a lot of sentimental clothing to store. Pick a bin that you feel is an appropriate size and add the sentimental clothing to it. When it's full you have to purge something to make space for the new outfit. If you don't have space, take pictures of the outfits (or look through your pictures... you probably have 638 of your child wearing the outfit anyway!). Then give them away to someone you know who has a child younger than yours or a new mom. Or donate them to a family shelter. Knowing your kids' clothes are being worn by someone who needs them will make it easier to let them go. 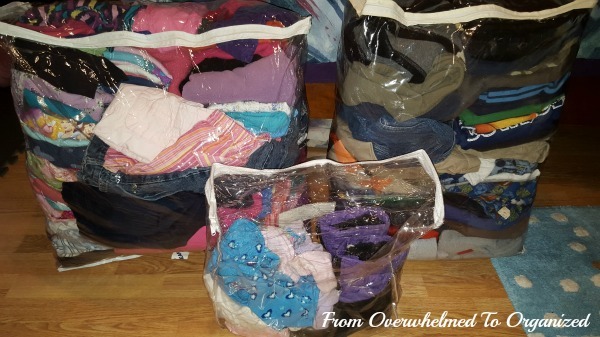 For more decluttering tips, here's a post showing how I decluttered my daughter's clothing a few years ago and what factors I used to decide what to keep and what to let go of. I've put a "Give Away" basket in each of my kids' closets (see my daughter's in this post) and we add add clothes to them until they're full. During larger decluttering sessions I empty the baskets and add more. Then we give the clothes to my sister-in-law for my niece and nephews or to other friends. I also sell some at Once Upon a Child sometimes. Here are the results of our most recent decluttering session. That's a "bed-in-a-bag" bag, a comforter bag, and a sheet set bag. Full of kids' clothes! And one pair of boots. I didn't count the items before I bagged them up since I normally don't count my kids' clothes in the 365 Items in 365 Days challenge. 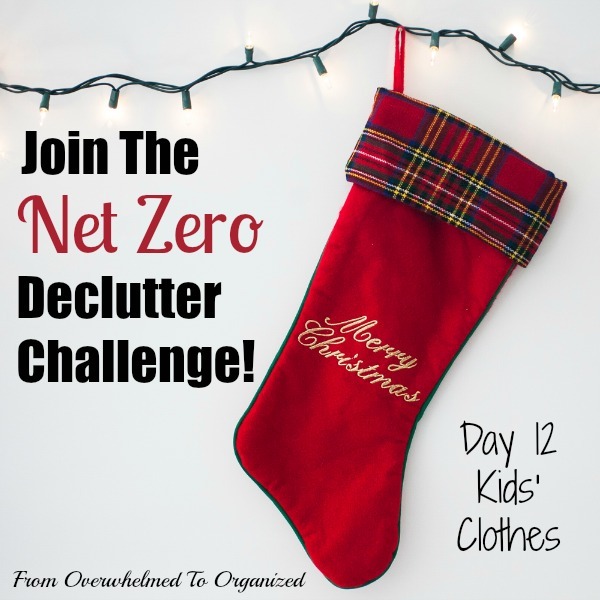 But for the NetZeroClutter challenge I want to include at least an estimate of the number of clothing items we decluttered since I'll be counting each individual item of clothing we receive this Christmas. So I'm going to estimate it as about 100 items. I'm pretty sure it's more than that, but some of them were technically decluttered before December and were waiting in their baskets. Now we have room in their closets and dresser drawers for the new clothing they'll receive for Christmas! So that puts me at -100 items today in the #NetZeroClutter challenge and -237 overall. 2 Happy Meal toys entered our home yesterday. I'm happy with my numbers but I want to keep decluttering... we have lots more where this came from! Take some time today to declutter your kids' clothing. Or anything you'd like to declutter! Take some pictures and share your progress on social media using the hashtag #NetZeroClutter. Let me know how you're doing in the challenge so I can cheer you on! How much of your kids' clothing did you declutter? How can you stay on top of kids' clothing clutter in the future so it's not as overwhelming? I do a pretty good job of keeping up with my son's clothing. I keep a donation box in our guest room and as soon as I notice something too small or an item he doesn't prefer to wear, it ends up in the box. When it gets full it gets passed on to a friend of mine. Having a system to keep your items moving is so important! Sounds like you've got a great system Sarah! That definitely makes all the difference. I don't have kids, but my clients do! Decluttering and donating on a regular basis definitely helps to keep the piles more manageable. One tip: Check with your local Goodwill. Mine takes clothing that is NOT in sell-able condition and recycles it. Thanks for the tip Hazel! Yes, some donation centers will take it and some won't so it's good to check. Some smaller charities are too overwhelmed with stuff to have to use manpower to sort stuff that's not sellable and others can even get a little income from selling it by the pound.